As you might know, Outdoor Creations serves various areas across the South East of England. A lot of our gardening is in built up areas such as large towns and cities like London. In these areas land is expensive which means many don’t have a garden, and those that do are lucky if it’s a few meters long! While a big garden could be used for many activities, even containing swimming pools or tennis courts, a small garden typically has less use to a home owner. In today’s blog we’re looking at how you can make use of a smaller garden. If you have grass in your garden you’ll need some form of mower. We’ve already talked about space & the cost of land, so storing a lawn mower is a big ask – that’s why many small gardens don’t include grass. While it’s not convenient to add real grass to a small garden, there’s nothing stopping you from adding fake grass to add a bit of colour to the area. Fake grass doesn’t need treating – it’s fake! The real bonus of fake grass is that if you decide you don’t like it, it’s really easy to just lift up and remove. Just because you have a small garden doesn’t mean you can’t grow your own veg, it just means you can’t grow it the normal way. Tomato plants actually grow pretty well upside down, provided they get enough water and nutrients you could enjoy some home grown tomatoes in the middle of the city! 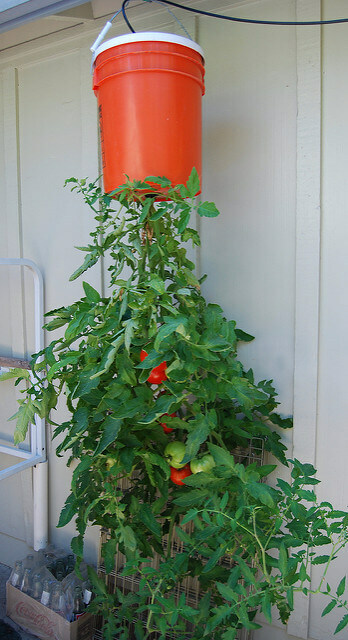 While to the right we can see a fairly sizeable tomato plant & bucket combo, this can be done a smaller scale. We’ve seen people planting tomatoes in the cut off tops of water bottles, these provide enough room for soil and even a little hole for the plant to grow out of the bottom. We wouldn’t advice using the whole of your garden for storage, however you can make very small storage sheds. We’ve seen tiny sheds made out of 4 old doors! Perfect for storing tools as well as any chairs you might have around the garden. Speaking of chairs, there’s no reason not to have a little seating area in your garden. We recommend director’s chairs as they’re comfortable, suitable for many uses and can easily be folded and stored in your tiny shed! Previous post Starting A Vegetable Garden Next post What Do You Need For A Summer Barbecue?